The Mars rover Curiosity does a test drill on a rock dubbed "Bonanza King" to see if it would be a good place to dig deeper and take a sample. But after the rock shifted, the test was stopped. 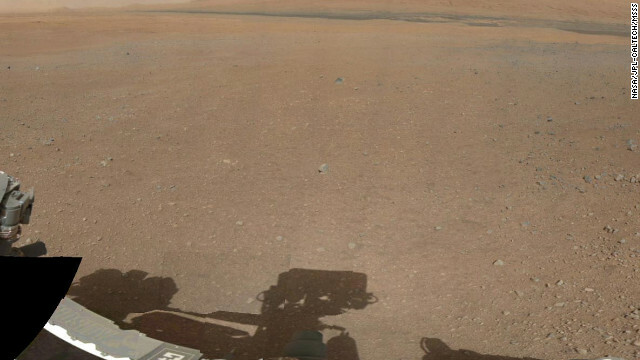 The NASA rover has now spent two years on the red planet. Curiosity set off from Earth in November 2011 and landed nearly nine months later -- 99 million miles away. Click through to see more of its images. Curiosity used the equivalent of a dust broom to sweep away reddish, oxidized dust from the Bonanza King rock. The rover's team decided to ditch the site and drive Curiosity toward other destinations. Wheel tracks from Curiosity are seen on the sandy floor of a lowland area dubbed "Hidden Valley" in this image taken August 4. The rover recently encountered this iron meteorite, which NASA named Lebanon. 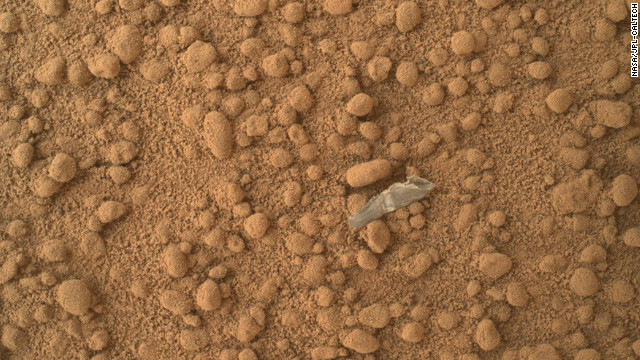 This find is similar in shape and luster to iron meteorites found on Mars by the previous generation of rovers. 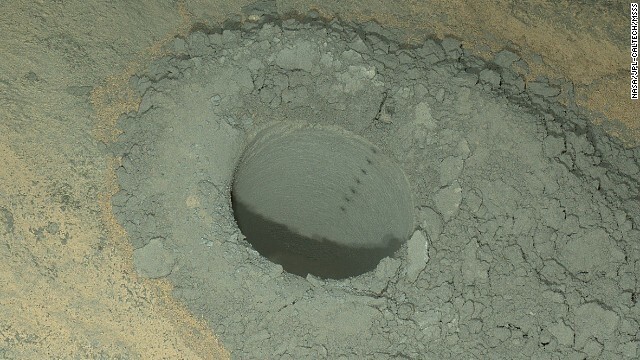 Curiosity took this nighttime photo of a hole it drilled May 5 to collect soil samples. NASA said this image combines eight exposures taken after dark on May 13. 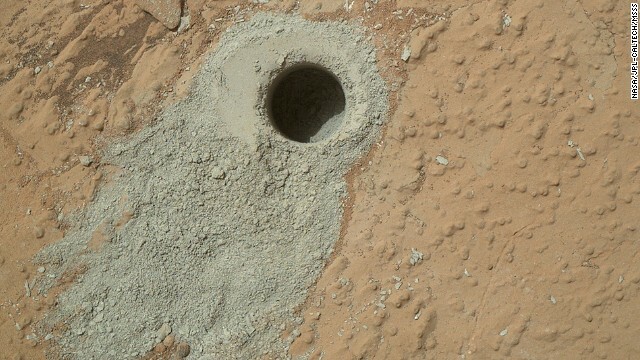 An arm of Curiosity drills two holes into sandstone on May 5. 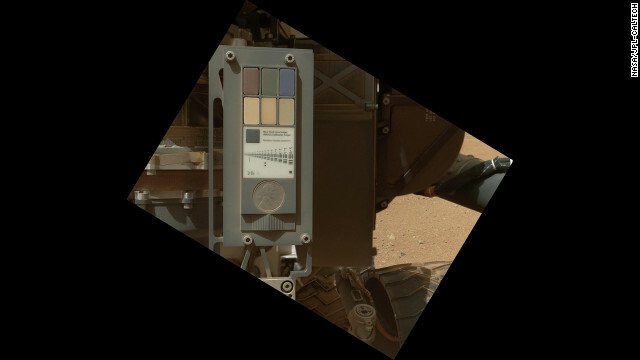 The rock powder collected will be analyzed by the rover's onboard instruments. NASA said the bright spot in this image taken in April could be merely a "glinting rock or cosmic-ray hit." 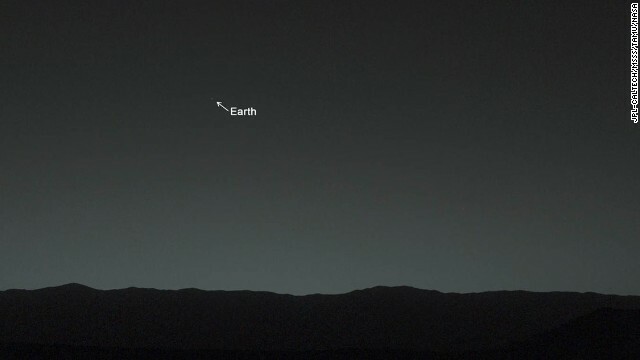 This view of the twilight sky and Martian horizon, taken by Curiosity, includes Earth as the brightest point of light in the night sky. Earth is a little left of center in the image, and our moon is just below Earth. A human observer with normal vision, if standing on Mars, could easily see Earth and the moon as two distinct, bright "evening stars." This mosaic of images from the Navigation Camera on Curiosity shows the terrain to the west from the rover's position on the 528th Martian day, or sol, of the mission on January 30. 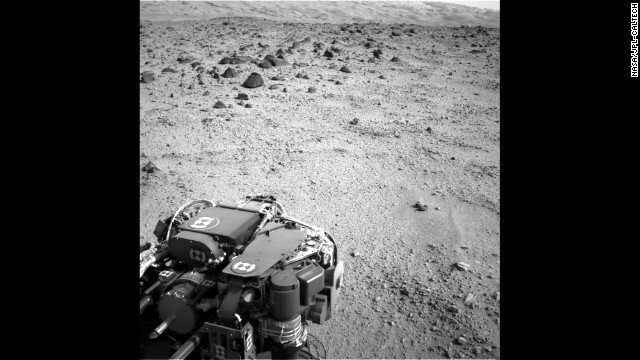 The images were taken right after Curiosity had arrived at the eastern edge of a location called "Dingo Gap." 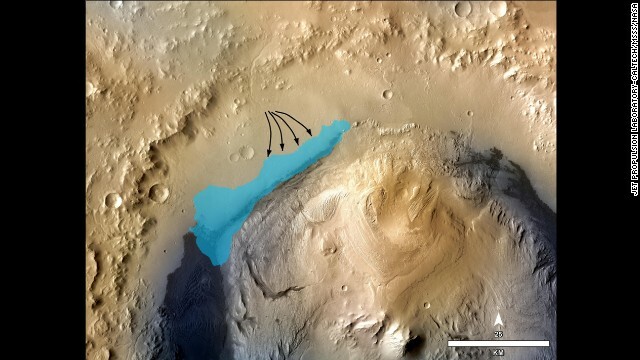 An illustration depicts the possible extent of an ancient lake inside Gale Crater, where the rover landed in August 2012. The $2.5 billion NASA mission set out to explore Gale Crater, which was thought to have once hosted flowing water. 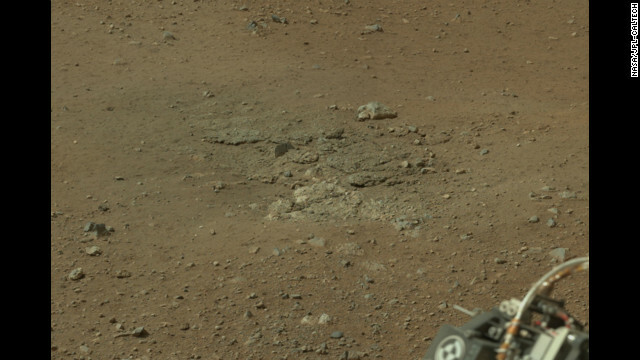 Curiosity found evidence of clay formations, or "mudstone," in the crater's Yellowknife Bay, scientists said in 2013. This clay may have held the key ingredients for life billions of years ago. It means a lake must have existed in the area. 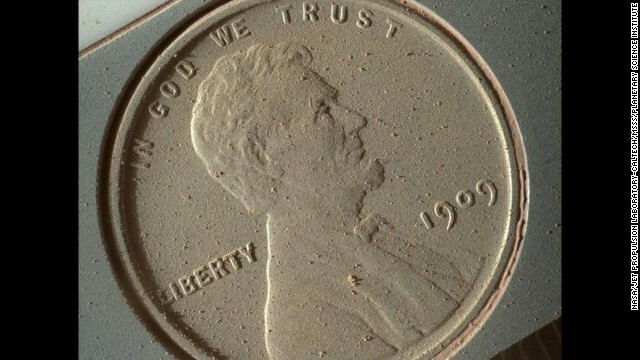 Martian dust appears on the surface of a penny that was brought along with the Curiosity rover and photographed by the Mars Hand Lens Imager on October 2. 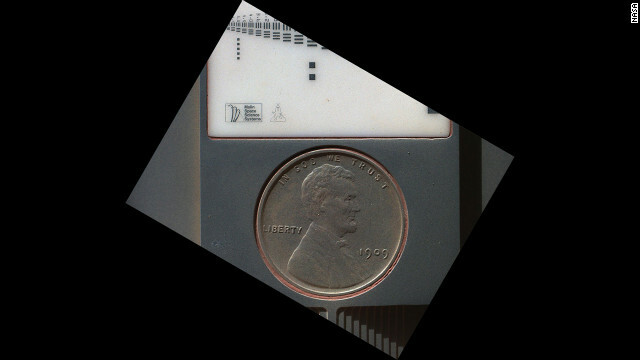 The image of the 1909 coin is at the highest resolution possible for the high-powered camera -- 14 micrometers per pixel (a micrometer is about .000039 inches). 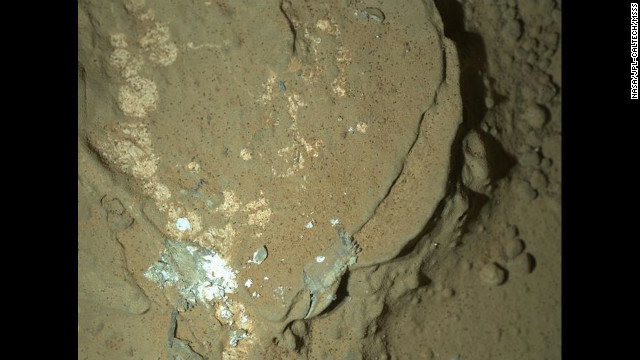 The Curiosity rover took this image of a rock formation informally dubbed "Darwin." Scientists had the rover stop in this region, called Waypoint 1, because it appeared to be a prime area to study the inner makeup and history of the floor of the Gale Crater. Analysis of Darwin may provide evidence of whether water played a role in the layering of rocks in this region. 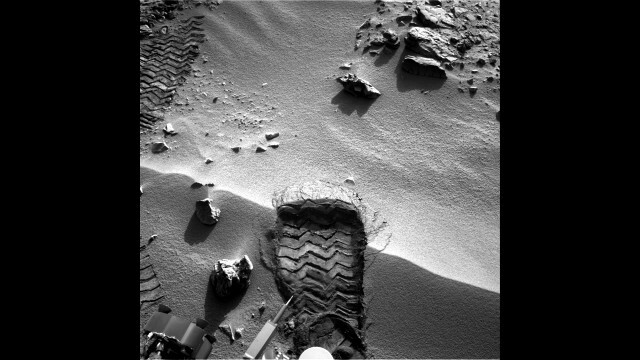 Curiosity began a trek toward Mount Sharp after spending more than six months in the "Glenelg" area. This image was taken on July 16, 2013, after the rover passed the 1-kilometer mark for the total distance covered since the start of the mission. The lower slopes of Mount Sharp are visible at the top of this image, taken on July 9, 2013. 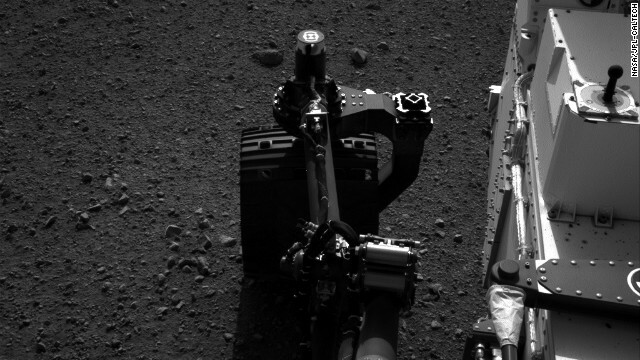 The turret of tools at the end of the rover's arm, including the rock-sampling drill in the lower left corner, can also be seen. 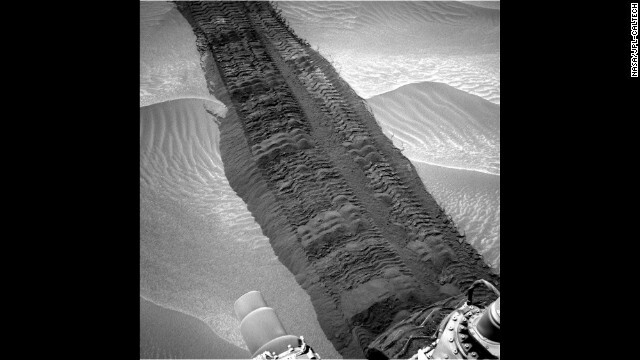 This image, taken by the rover on July 8, 2013, shows the tracks left behind after the rover's first drive away from the "Glenelg" area. 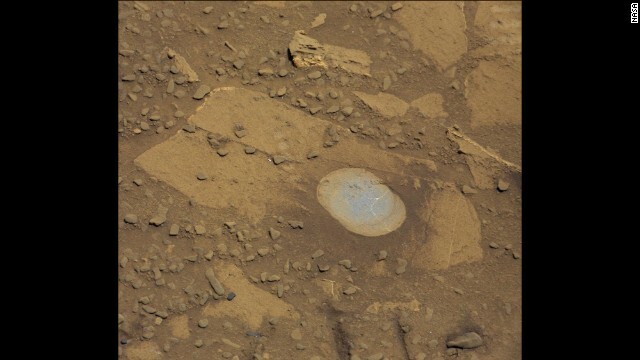 Curiosity drilled into a rock target called "Cumberland" on May 19, 2013, and it collected a powdered sample of material from the rock's interior. The sample will be compared to an earlier drilling at the "John Klein" site, which has a similar appearance and is about 9 feet away. Mars once had conditions favorable for microbial life, NASA scientists announced on March 12, 2013. 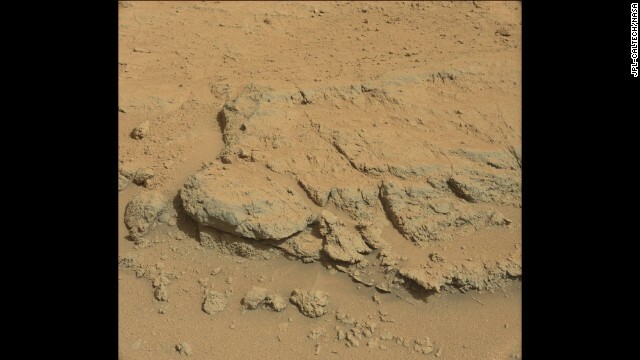 One piece of evidence for that conclusion comes from this area of the Martian surface, nicknamed "Sheepbed." It shows veins of sediments that scientist believe were deposited under water and was an environment once hospitable to life. 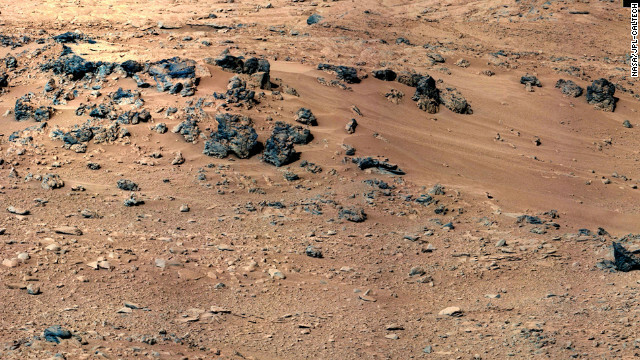 The rock on the left, called Wopmay, was discovered by the rover Opportunity, which arrived in 2004 on a different part of Mars. Iron-bearing sulfates indicate that this rock was once in acidic waters. 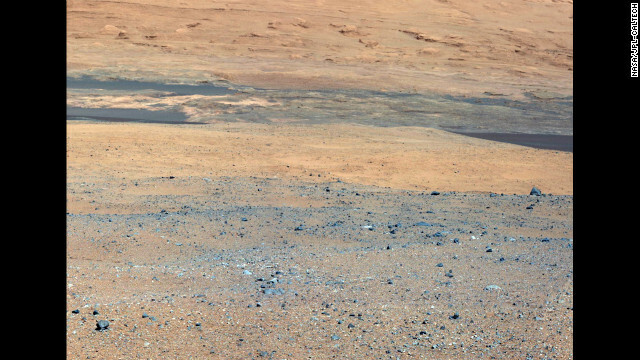 On the right are rocks from Yellowknife Bay, where rover Curiosity was situated. These rocks are suggestive of water with a neutral pH, which is hospitable to life formation. 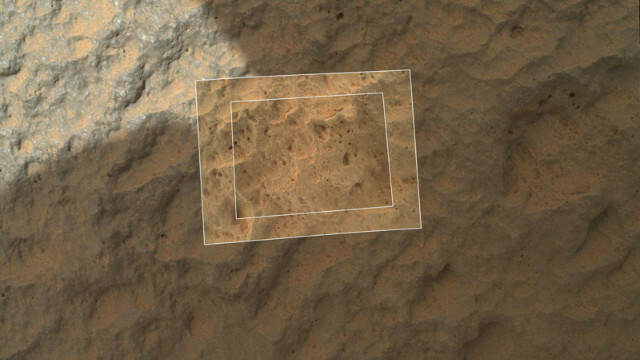 Curiosity shows the first sample of powdered rock extracted by the rover's drill. The image was taken by Curiosity's mast camera on February 20, 2013. 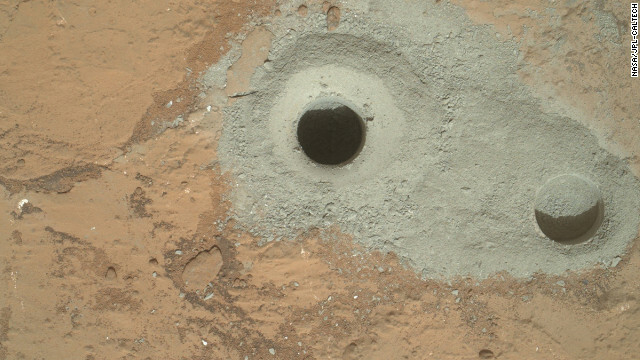 The rover drilled this hole, in a rock that's part of a flat outcrop researchers named "John Klein," during its first sample drilling on February 8, 2013. 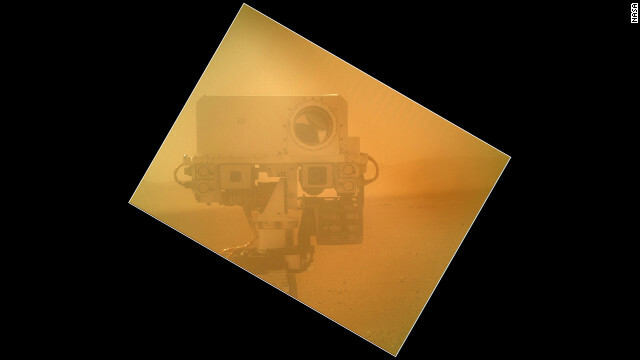 This self-portrait of the rover combines dozens of images taken by the rover's Mars Hand Lens Imager on February 3, 2013. 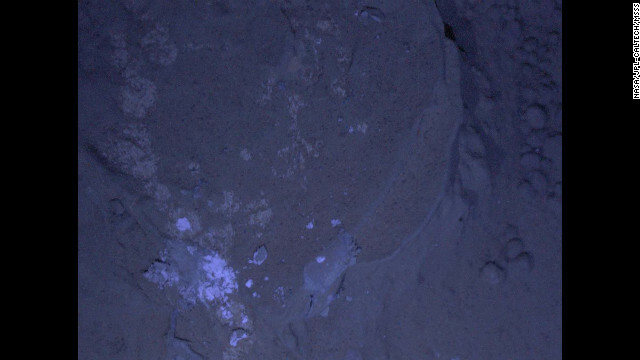 Curiosity's first set of nighttime photos include this image of Martian rock illuminated by ultraviolet lights. Curiosity used the camera on its robotic arm, the Mars Hand Lens Imager, to capture the images on January 22, 2013. Another nighttime image includes this rock called Sayunei in the Yellowknife Bay area of Mars' Gale Crater. 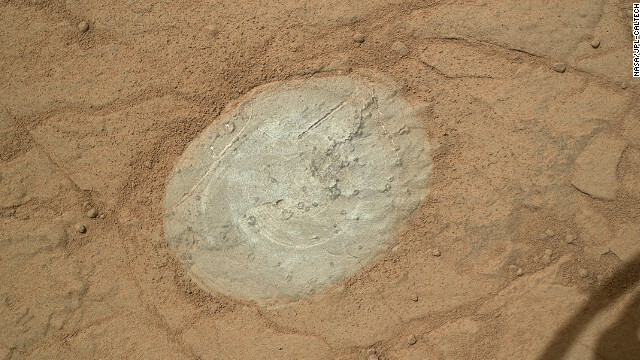 Curiosity's front-left wheel had scraped the rock to inspect for fresh, dust-free materials in an area where drilling for rock would soon begin. Other night photos included this image of the calibration target for the Mars Hand Lens Imager camera at the end of the rover's robotic arm. For scale, a penny on the calibration target is three-fourths of an inch in diameter. A view of what NASA describes as "veined, flat-lying rock." 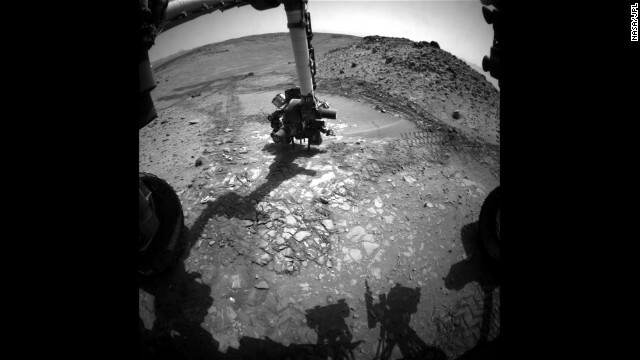 It was selected as the first drilling site for the Mars rover. Curiosity used a dust-removal tool for the first time to clean this patch of rock on the Martian surface on January 6, 2013. The rover captured this mosaic of images of winding rocks known as the Snake River on December 20, 2012. A view of the shallow depression known as "Yellowknife Bay," taken by the rover on December 12, 2012. 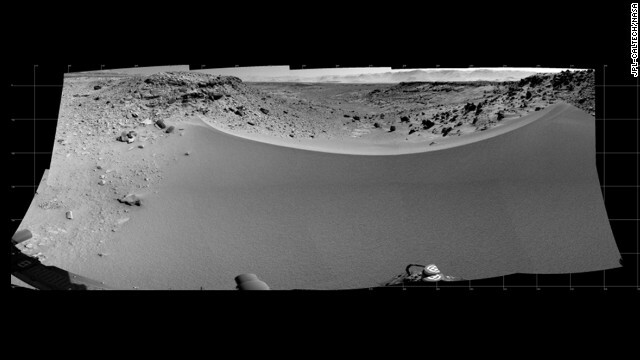 The Mars rover Curiosity recorded this view from its left navigation camera after an 83-foot eastward drive on November 18, 2012. 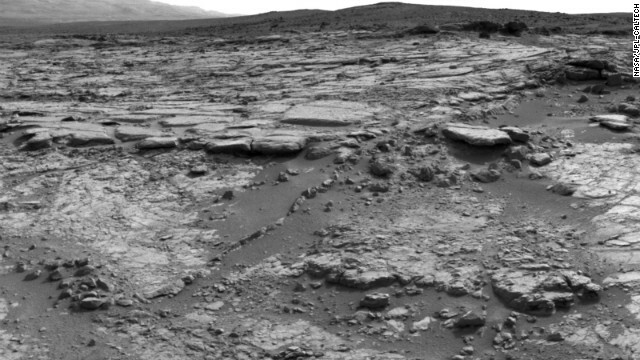 The view is toward "Yellowknife Bay" in the "Glenelg" area of Gale Crater. Three "bite marks" made by the rover's scoop can be seen in the soil on Mars surface on October 15, 2012. 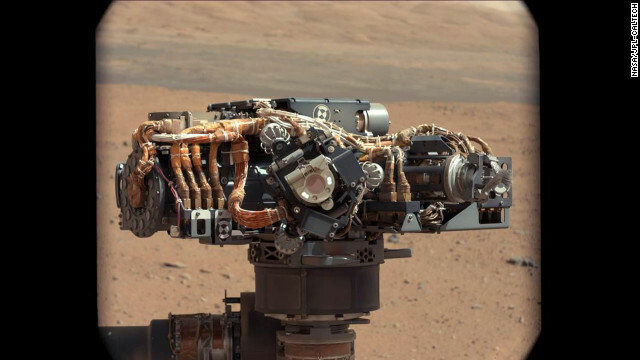 The robotic arm on NASA's Mars rover Curiosity delivered a sample of Martian soil to the rover's observation tray for the first time on October 16, 2012. 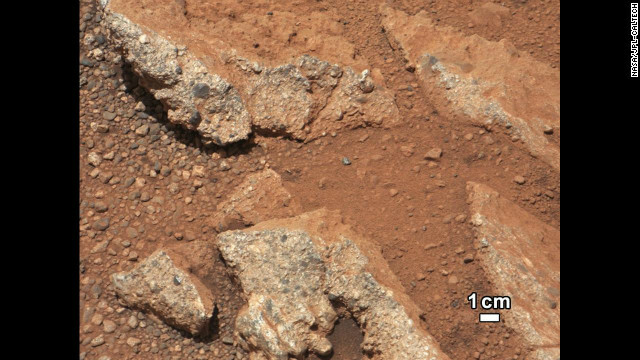 This image shows part of the small pit or bite created when NASA's Mars rover Curiosity collected its second scoop of Martian soil on October 15, 2012. The rover team determined that the bright particle near the center of the image was native to Mars, and not debris from the rover's landing. This image shows what the rover team has determined to be a piece of debris from the spacecraft, possibly shed during the landing. 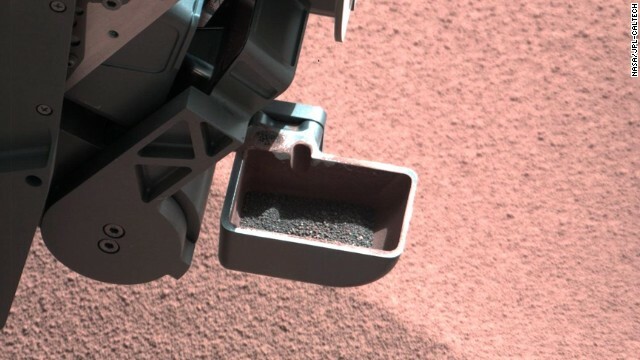 The rover's scoop contains larger soil particles that were too big to filter through a sample-processing sieve. 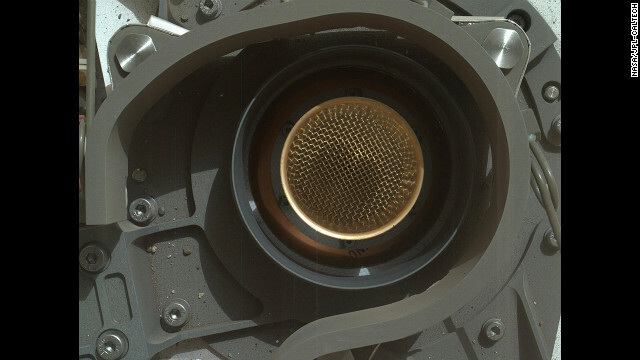 After a full-scoop sample had been vibrated over the sieve, this portion was returned to the scoop for inspection by the rover's mast camera. 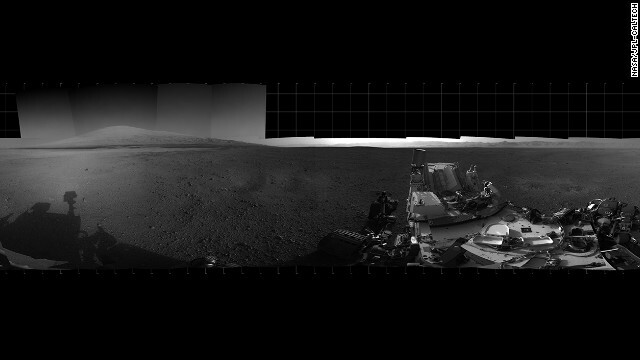 This 360-degree panorama shows the area where the rover will spend about three weeks collecting scoopfuls of soil for examination. 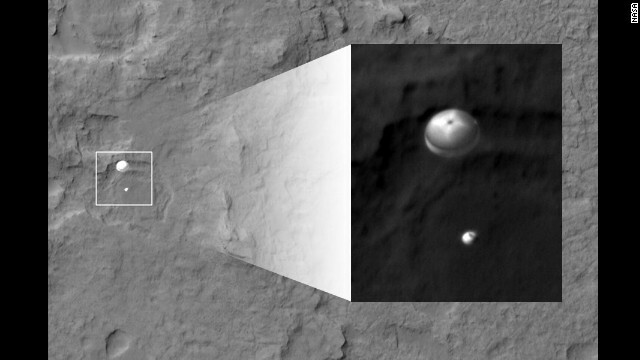 The photo comprises images taken from the rover's navigation camera on October 5, 2012. An area of windblown sand and dust downhill from a cluster of dark rocks has been selected as the likely location for the first use of the scoop on the arm of NASA's Mars rover Curiosity. 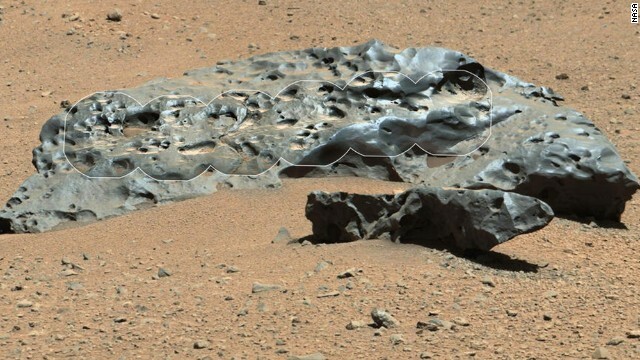 Curiosity cut a wheel scuff mark into a wind-formed ripple at the "Rocknest" site on October 3, 2012. This gave researchers a better opportunity to examine the particle-size distribution of the material forming the ripple. NASA's Curiosity rover found evidence for what scientists believe was an ancient, flowing stream on Mars at a few sites, including the rock outcrop pictured here. The key evidence for the ancient stream comes from the size and rounded shape of the gravel in and around the bedrock, according to the Jet Propulsion Laboratory/Caltech science team. The rounded shape leads the science team to conclude they were transported by a vigorous flow of water. The grains are too large to have been moved by wind. This photo is an up-close look at an outcrop that also shows evidence of flowing water, according to the JPL/Caltech science team. The outcrop's characteristics are consistent with rock that was formed by the deposition of water and is composed of many smaller rounded rocks cemented together. Water transport is the only process capable of producing the rounded shape of conglomerate rock of this size. Curiosity completed its longest drive to date on September 26, 2012. The rover moved about 160 feet east toward the area known as "Glenelg." As of that day the rover had moved about a quarter-mile from its landing site. 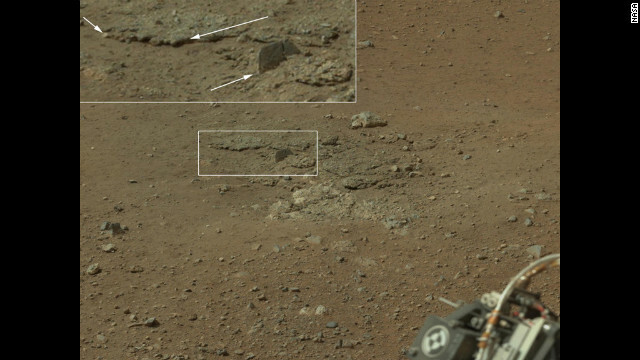 This image shows the robotic arm of NASA's Mars rover Curiosity with the first rock touched by an instrument on the arm. 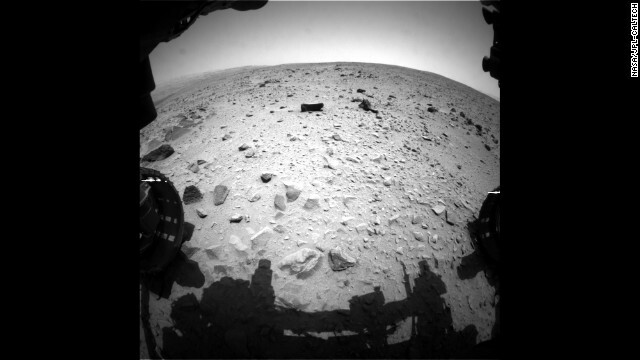 The photo was taken by the rover's right navigation camera. This image combines photographs taken by the rover's Mars Hand Lens Imager at three distances from the first Martian rock that NASA's Curiosity rover touched with its arm. 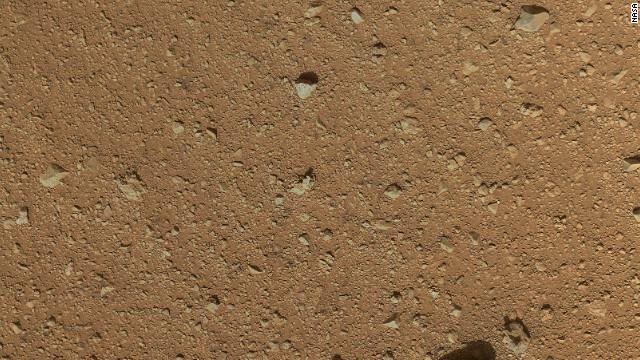 The images reveal that the target rock has a relatively smooth, gray surface with some glinty facets reflecting sunlight and reddish dust collecting in recesses in the rock. 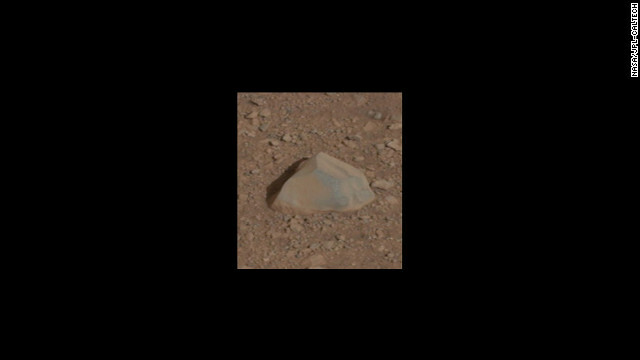 This rock will be the first target for Curiosity's contact instruments. 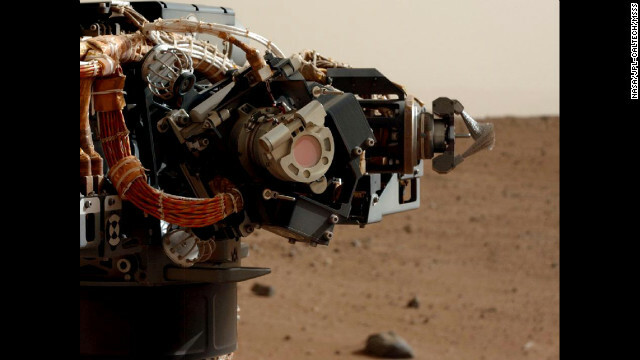 Located on a turret at the end of the rover's arm, the contact instruments include the Alpha Particle X-Ray Spectrometer for reading a target's elemental composition and the Mars Hand Lens Imager for close-up imaging. 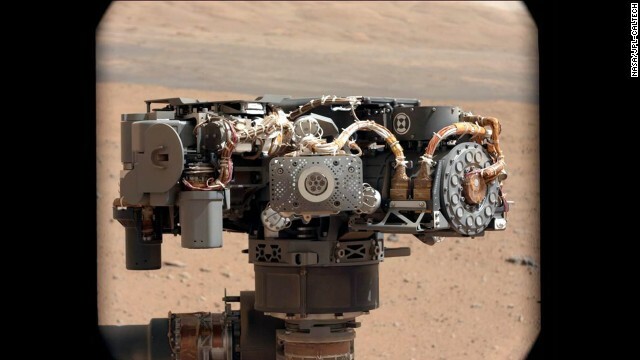 Researchers used the Curiosity rover's mast camera to take a photo of the Alpha Particle X-Ray Spectrometer. 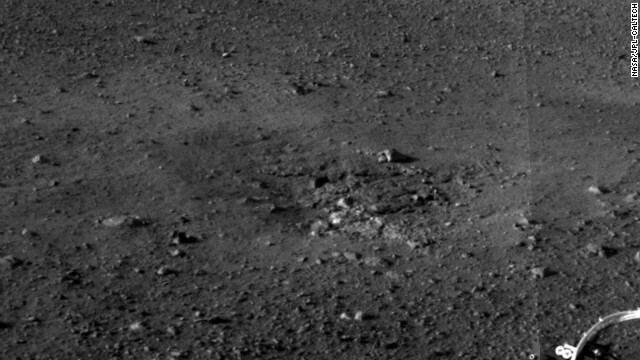 The image was used to see if it had been caked in dust during the landing. 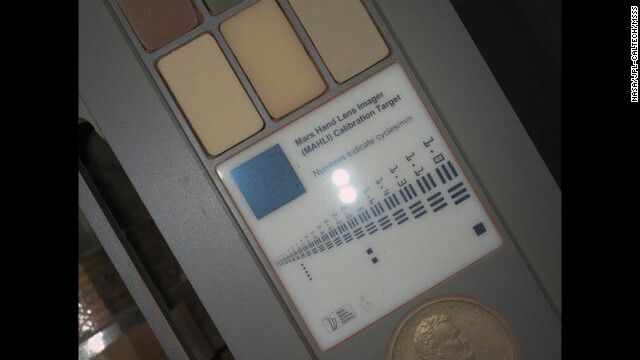 Researchers also used the mast camera to examine the Mars Hand Lens Imager (MAHLI) on the rover to inspect its dust cover and check that its LED lights were functional. In this image, taken on September 7, 2012, the MAHLI is in the center of the screen with its LED on. The main purpose of Curiosity's MAHLI camera is to acquire close-up, high-resolution views of rocks and soil from the Martian surface. This is the open inlet where powdered rock and soil samples will be funneled down for analysis. The image is made up of eight photos taken on September 11, 2012, by MAHLI and is used to check that the instrument is operating correctly. This is the calibration target for the MAHLI. 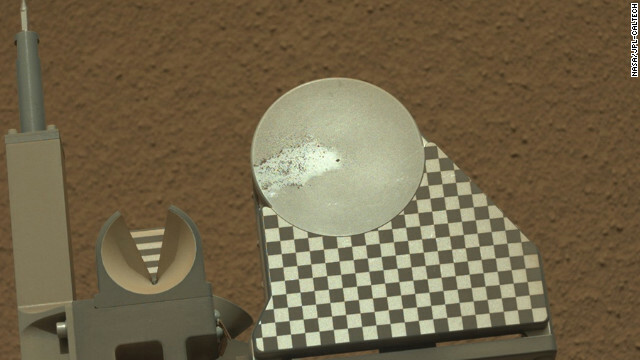 This image, taken on September 9, 2012, shows that the surface of the calibration target is covered with a layor of dust as a result of the landing. The calibration target includes color references, a metric bar graphic, a penny for scale comparison, and a stair-step pattern for depth calibration. 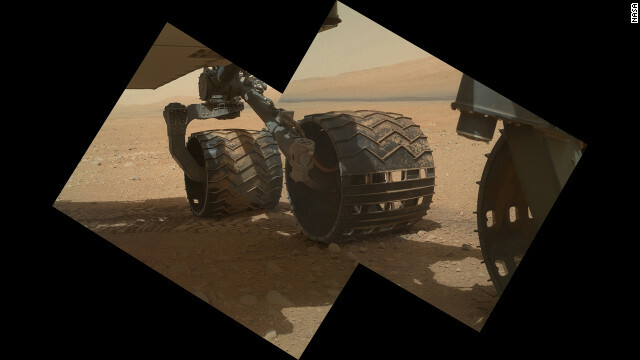 This view of the three left wheels of NASA's Mars rover Curiosity combines two images that were taken by the rover's Mars Hand Lens Imager on September 9, 2012, the 34th day of Curiosity's work on Mars. In the distance is the lower slope of Mount Sharp. This view of the lower front and underbelly areas of NASA's Mars rover Curiosity was taken by the rover's Mars Hand Lens Imager. Also visible are the hazard avoidance cameras on the front of the rover. 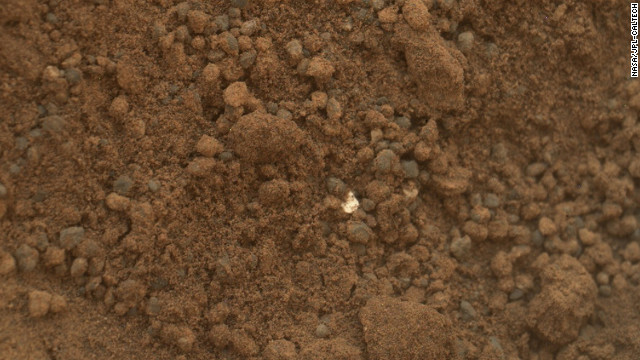 The penny in this image is part of a camera calibration target on NASA's Mars rover Curiosity. 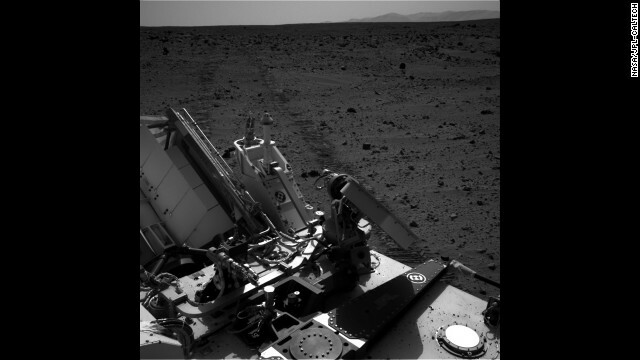 The image was taken by the Mars Hand Lens Imager camera. 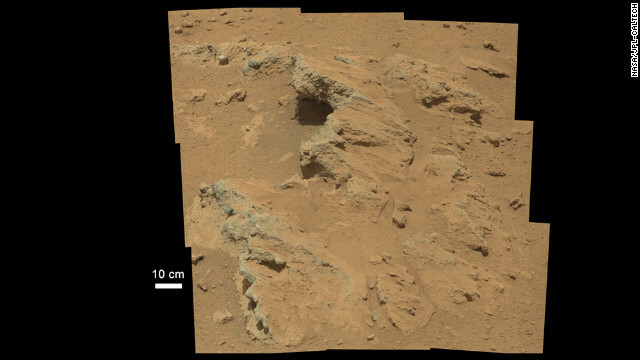 The rover captured this mosiac of a rock feature called 'Snake River" on December 20, 2012. 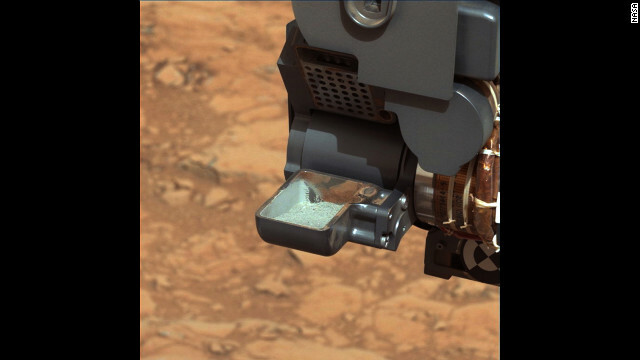 The reclosable dust cover on Curiosity's Mars Hand Lens Imager was opened for the first time on September 8, 2012, enabling MAHLI to take this image. 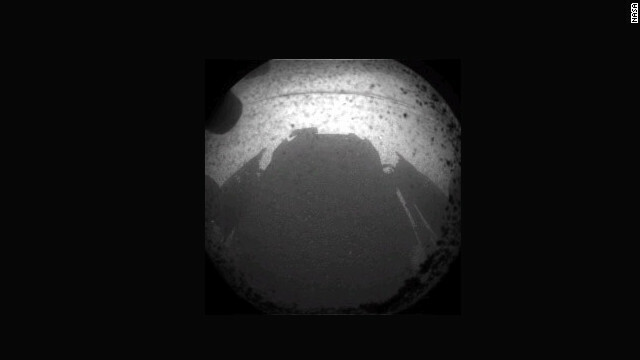 The Curiosity rover used a camera located on its arm to obtain this self-portrait on September 7, 2012. The image of the top of Curiosity's Remote Sensing Mast, showing the Mastcam and Chemcam cameras, was taken by the Mars Hand Lens Imager. 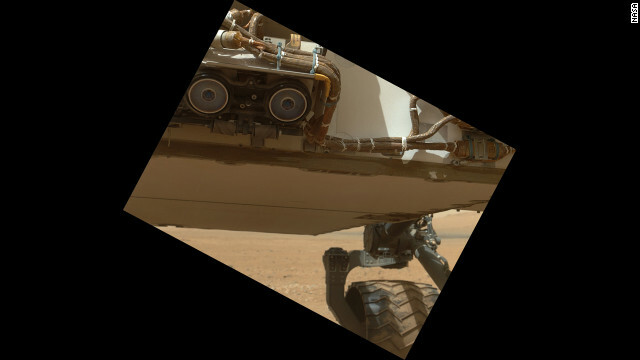 The angle of the frame reflects the position of the MAHLI camera on the arm when the image was taken. 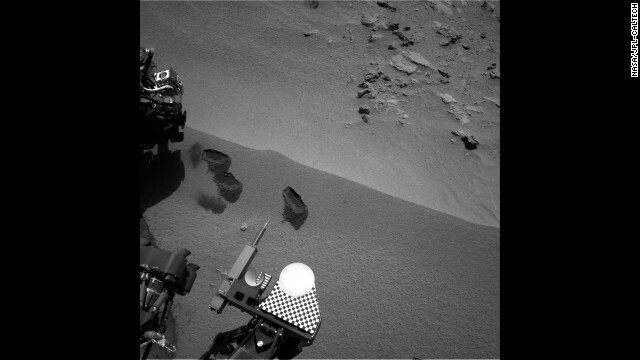 The left eye of the Mast Camera on NASA's Mars rover Curiosity took this image of the rover's arm on September 5, 2012. 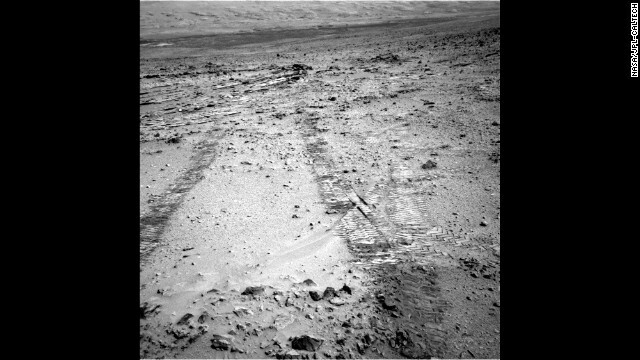 Sub-image one of three shows the rover and its tracks after a few short drives. Tracking the tracks will provide information on how the surface changes as dust is deposited and eroded. Sub-image two shows the parachute and backshell, now in color. The outer band of the parachute has a reddish color. 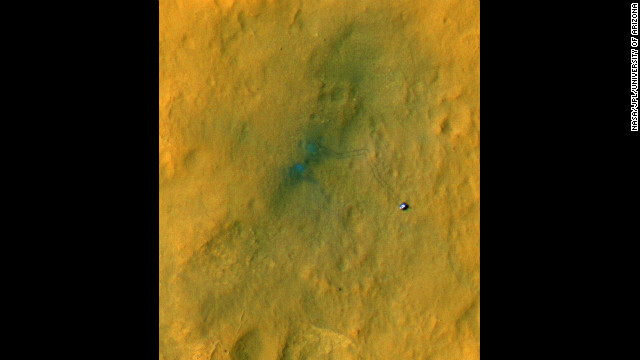 Sub-image three shows the descent stage crash site, now in color, and several distant spots (blue in enhanced color) downrange that are probably the result of distant secondary impacts that disturbed the surface dust. An image released August 27, 2012, was taken with Curiosity rover's 100-millimeter mast camera, NASA says. 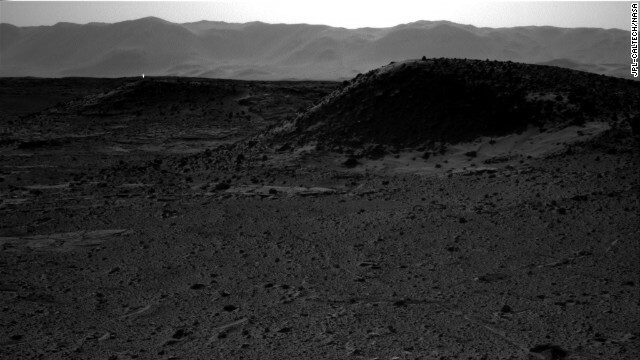 The image shows Mount Sharp on the Martian surface. NASA says the rover will go to this area. The Mars rover Curiosity moved about 15 feet forward and then reversed about 8 feet during its first test drive on August 22, 2012. 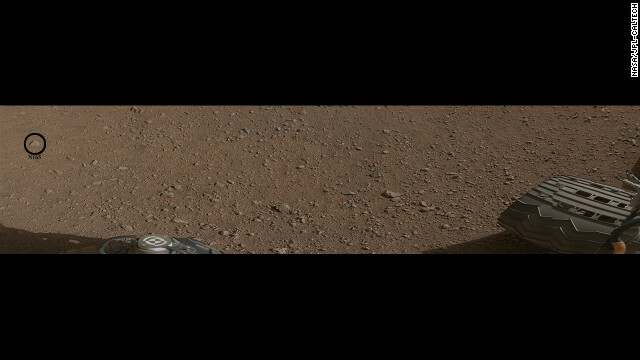 The rover's tracks can be seen in the right portion of this panorama taken by the rover's navigation camera. 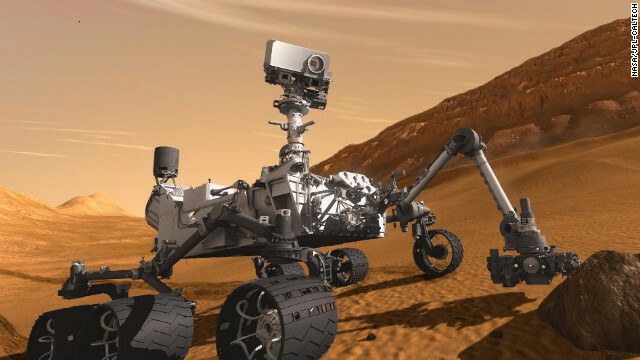 NASA tested the steering on its Mars rover Curiosity on August 21, 2012. 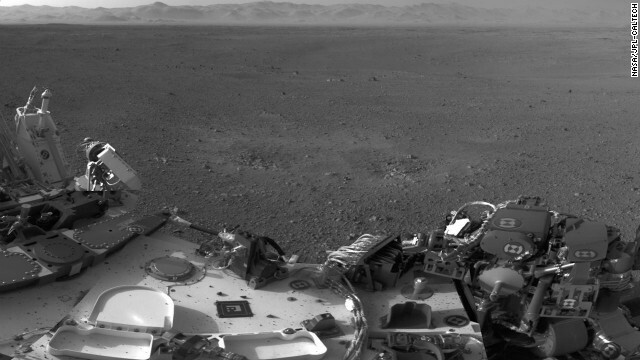 Drivers wiggled the wheels in place at the landing site on Mars. 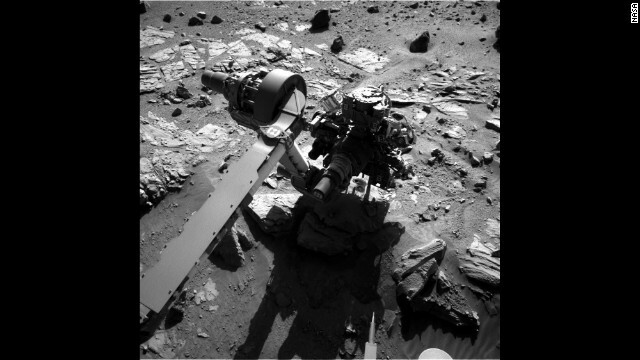 Curiosity moved its robot arm on August 20, 2012, for the first time since it landed on Mars. "It worked just as we planned," said JPL engineer Louise Jandura in a NASA press release. This picture shows the 7-foot-long arm holding a camera, a drill, a spectrometer, a scoop and other tools. The arm will undergo weeks of tests before it starts digging. 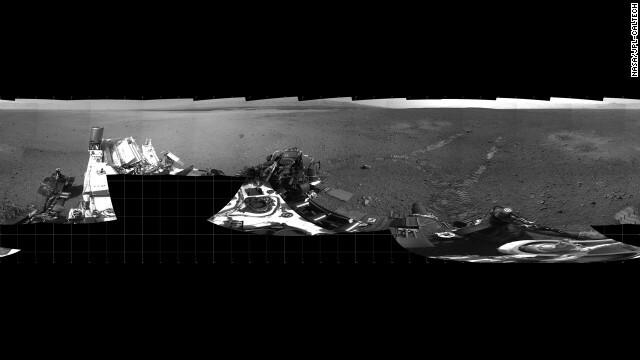 With the addition of four high-resolution Navigation Camera, or Navcam, images, taken on August 18, 2012. 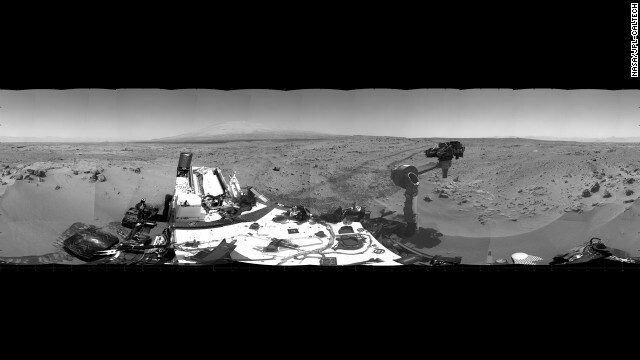 Curiosity's 360-degree landing-site panorama now includes the highest point on Mount Sharp visible from the rover. Mount Sharp's peak is obscured from the rover's landing site by this highest visible point. 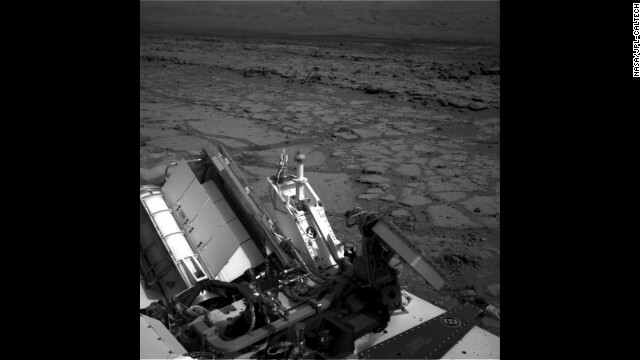 An updated self-portrait of the Mars rover Curiosity, showing more of the rover's deck. This image is a mosiac compiled from images taken from the navigation camera. The wall of Gale Crater, the rover's landing site, can be seen at the top of the image. 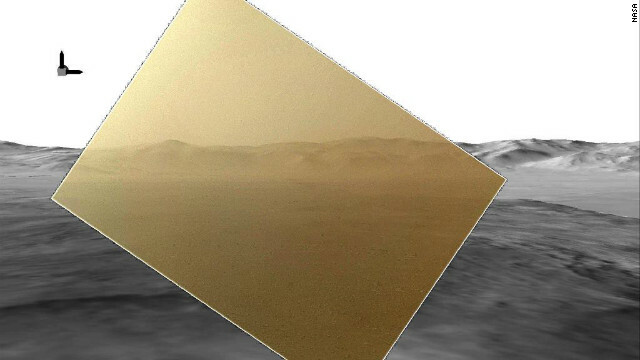 This image shows what will be the rover's first target with it's chemistry and camera (ChemCam) instrument. 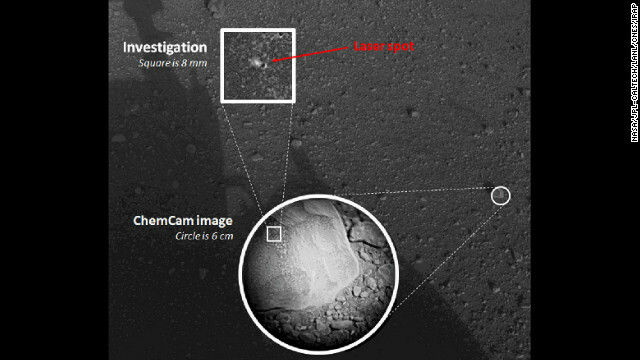 The ChemCam will fire a laser at the rock, indicated by the black circle. The laser will cause the rock to emit plasma, a glowing, ionized gas. The rover will then analyze the plasma to determine the chemical composition of the rock. 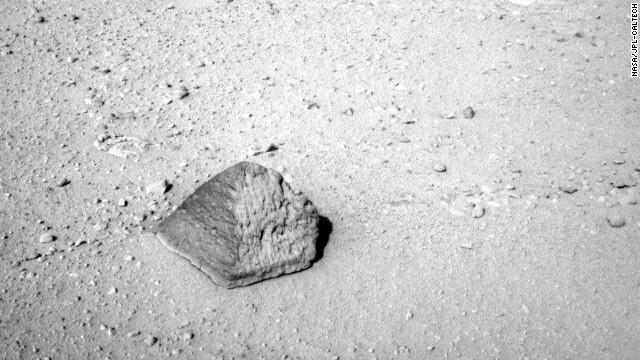 This is a close-up of the rock that will be the ChemCam's first target. 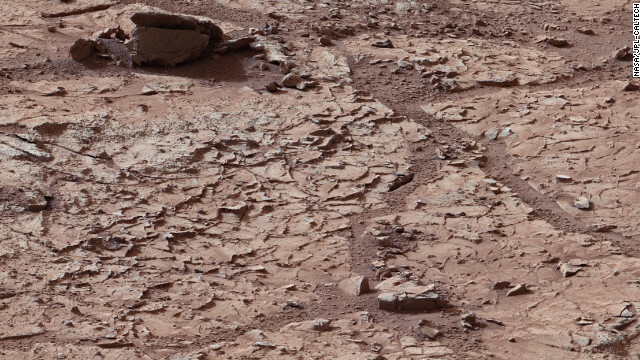 This image, cropped from a larger panorama, shows an area, near the rover's rear left wheel, where the surface material was blown away by the descent-stage rockets. 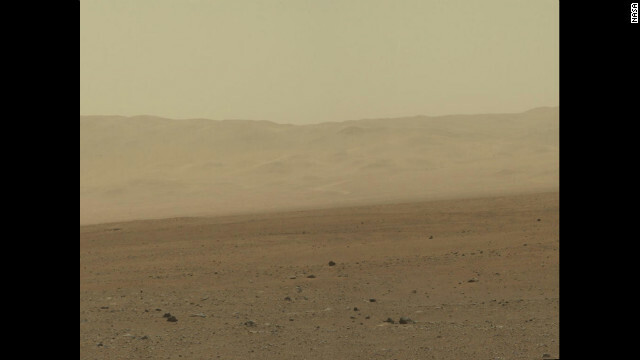 This image, with a portion of the rover in the corner, shows the wall of Gale Crater running across the horizon at the top of the image. 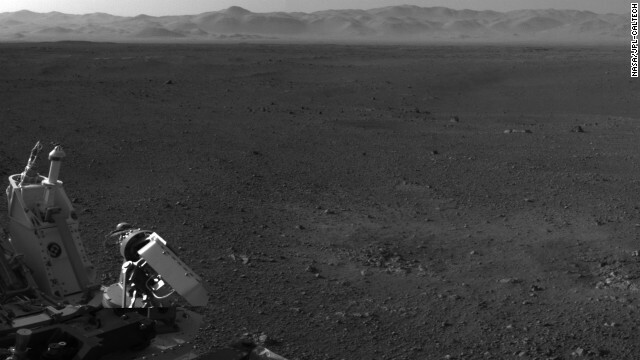 This image, taken from the rover's mast camera, looks south of the landing site toward Mount Sharp. 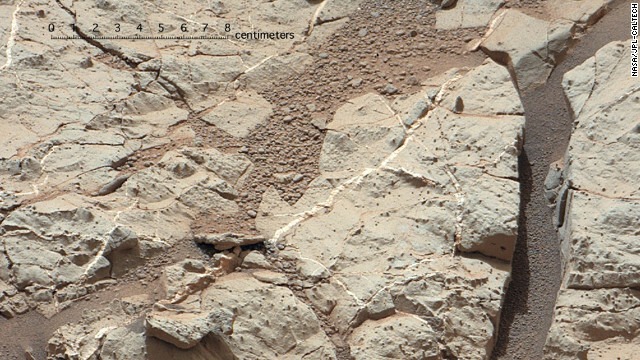 This partial mosaic from the Curiosity rover shows Mars' environment around the rover's landing site on Gale Crater. NASA says the pictured landscape resembles portions of the U.S. Southwest. The high-resolution mosaic includes 130 images, but not all the images have been returned by the rover to Earth. The blackened areas of the mosaic are the parts that haven't been transmitted yet. 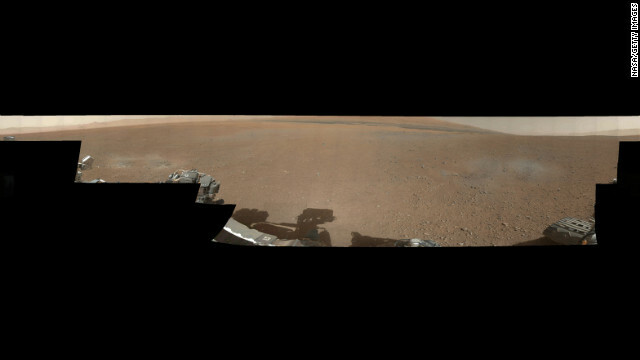 See more on this panaroma on NASA's site. In this portion of the larger mosaic from the previous frame, the crater wall can be seen north of the landing site, or behind the rover. NASA says water erosion is believed to have created a network of valleys, which enter Gale Crater from the outside here. 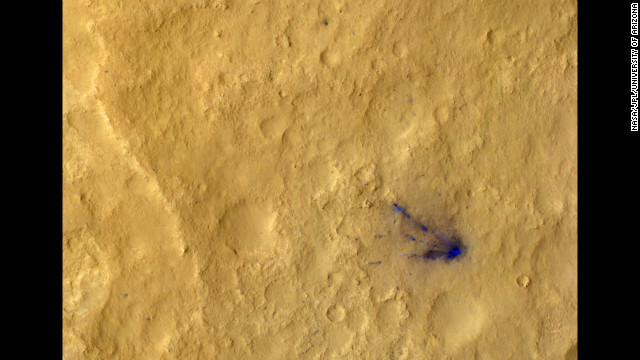 Two blast marks from the descent stage's rockets can be seen in the center of this image. 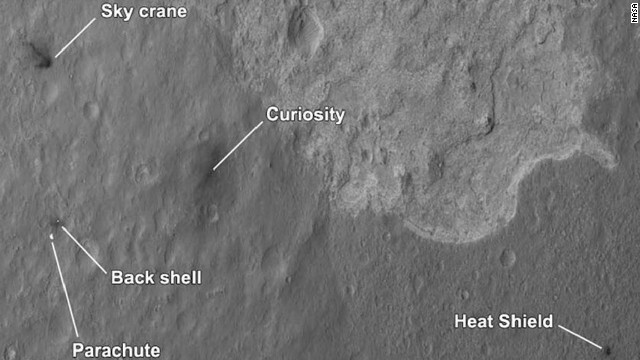 Also seen is Curiosity's left side. This picture is a mosaic of images taken by the rover's navigation cameras. 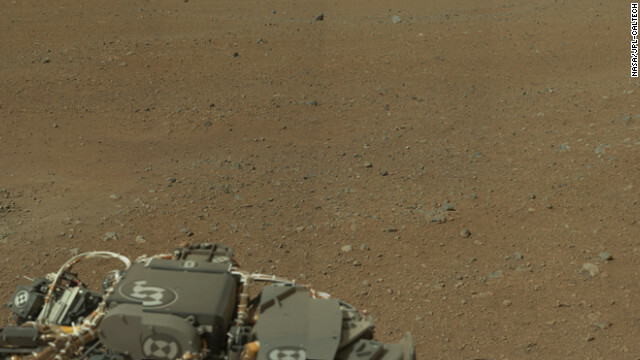 A color image from NASA's Curiosity rover shows the pebble-covered surface of Mars. This panorama mosaic was made of 130 images of 144 by 144 pixels each. Selected full frames from this panorama, which are 1,200 by 1,200 pixels each, are expected to be transmitted to Earth later. 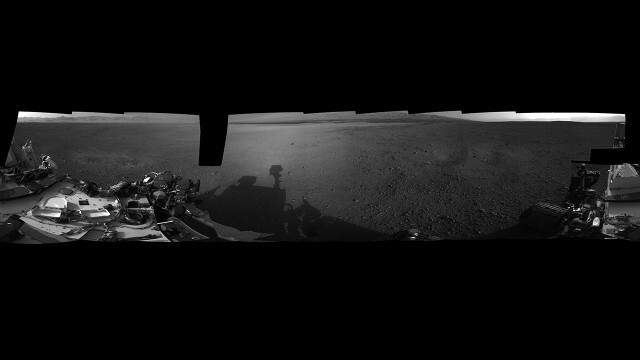 A panoramic photograph shows the Curiosity rover's surroundings at its landing site inside Gale Crater. The rim of Gale Crater can be seen to the left, and the base of Mount Sharp is to the center-right. A partial view of a 360-degree color panorama of the Curiosity rover's landing site on Gale Crater. The panorama comes from low-resolution versions of images taken August 9, 2012, with a 34-millimeter mast camera. 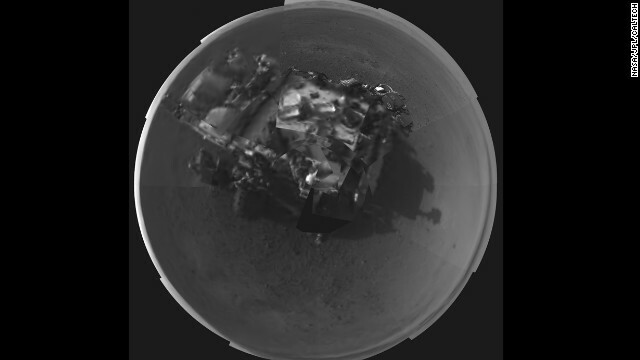 Cameras mounted on Curiosity's remote sensing mast have beamed back fresh images of the site. 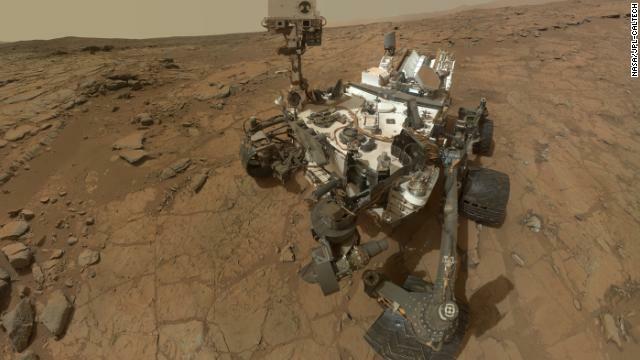 NASA's Curiosity rover took this self-portrait using a camera on its newly deployed mast. A close-up view of an area at the NASA Curiosity landing site where the soil was blown away by the thrusters during the rover's descent on August 6, 2012. The excavation of the soil reveals probable bedrock outcrop, which shows the shallow depth of the soil in this area. 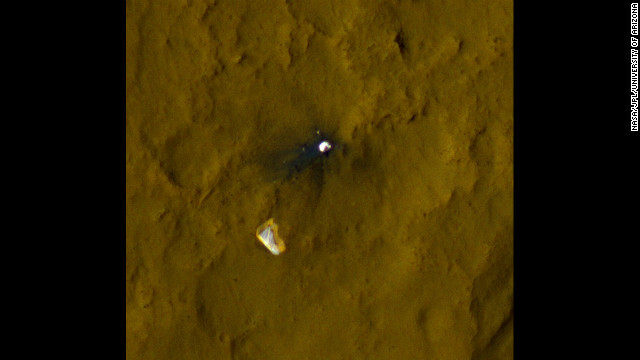 This color full-resolution image showing the heat shield of NASA's Curiosity rover was obtained during descent to the surface of Mars on August 13, 2012. 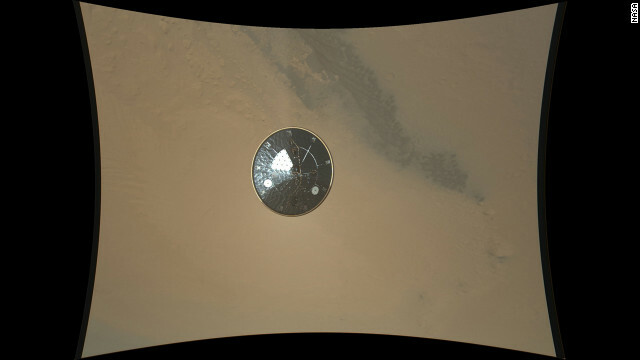 The image was obtained by the Mars Descent Imager instrument known as MARDI and shows the 15-foot diameter heat shield when it was about 50 feet from the spacecraft. 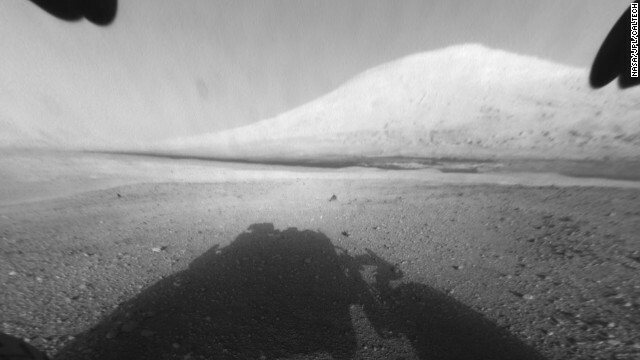 This first image taken by the Navigation cameras on Curiosity shows the rover's shadow on the surface of Mars. The color image captured by NASA's Mars rover Curiosity on August 7, 2012, has been rendered about 10% transparent so that scientists can see how it matches the simulated terrain in the background. 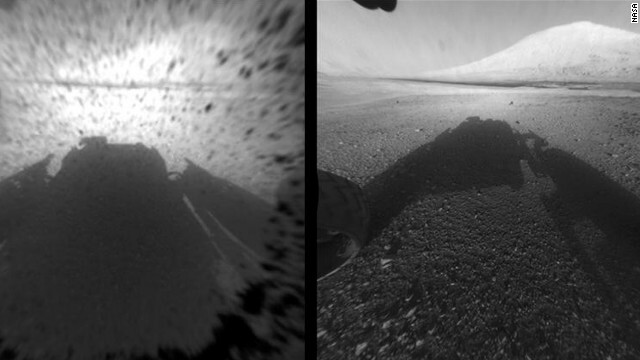 This image comparison shows a view through a Hazard-Avoidance camera on NASA's Curiosity rover before and after the clear dust cover was removed. 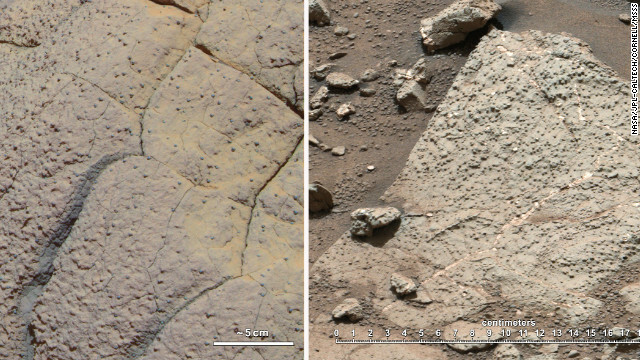 Both images were taken by a camera at the front of the rover. Mount Sharp, the mission's ultimate destination, looms ahead. The four main pieces of hardware that arrived on Mars with NASA's Curiosity rover were spotted by NASA's Mars Reconnaissance Orbiter. 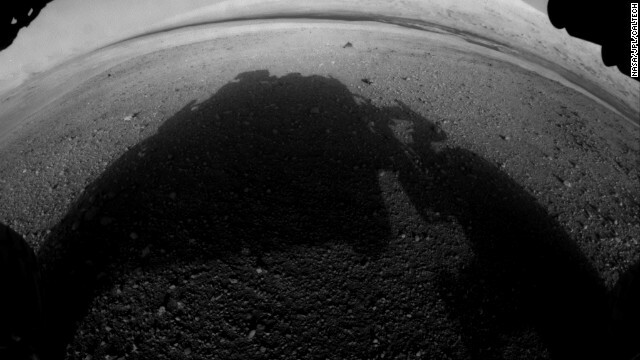 The High-Resolution Imaging Science Experiment camera captured this image about 24 hours after landing. 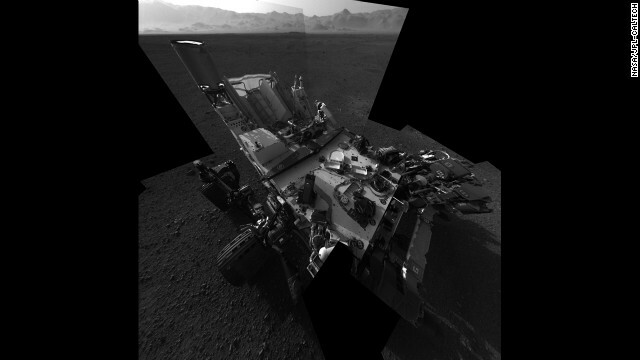 This image is a 3-D view in front of NASA's Curiosity rover. 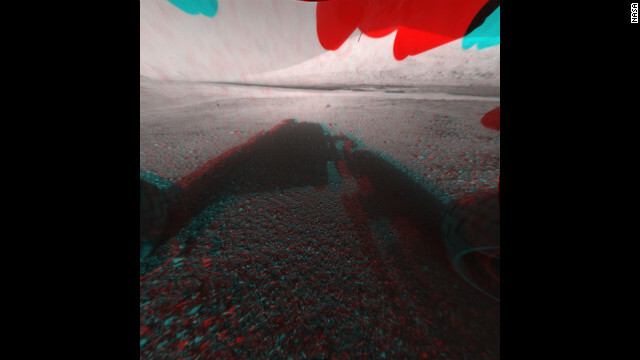 The anaglyph was made from a stereo pair of Hazard-Avoidance Cameras on the front of the rover. Mount Sharp, a peak that is about 3.4 miles high, is visible rising above the terrain, though in one "eye" a box on the rover holding the drill bits obscures the view. 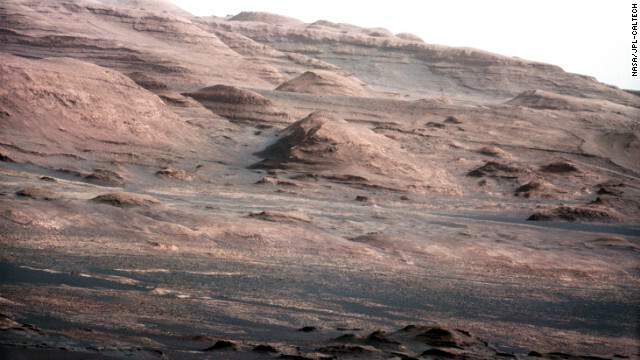 This view of the landscape to the north of NASA's Mars rover Curiosity was acquired by the Mars Hand Lens Imager on the first day after landing. 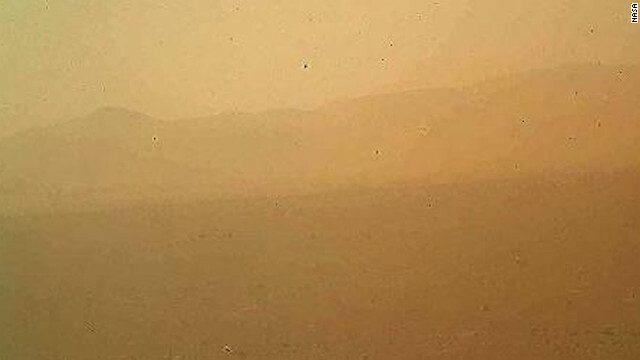 This is one of the first pictures taken by Curiosity after it landed. It shows the rover's shadow on the Martian soil. 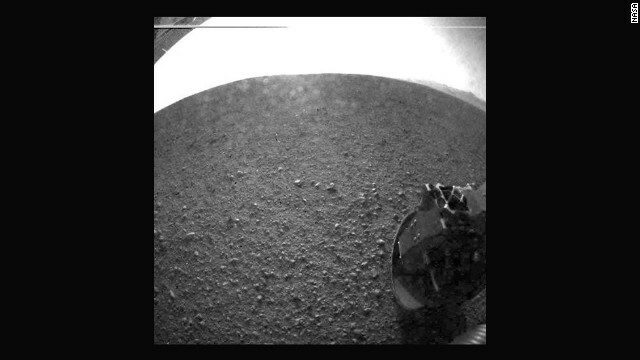 Another of the first images taken by the rover. The clear dust cover that protected the camera during landing has popped open. 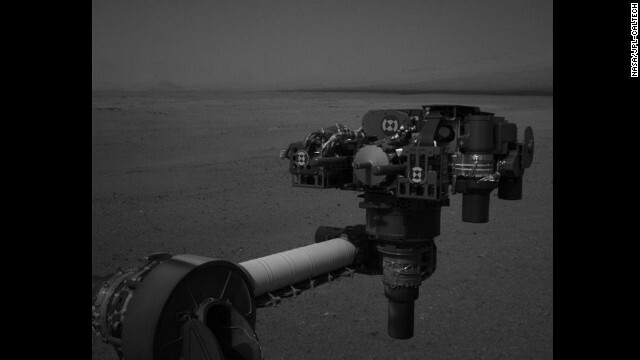 Part of the spring that released the dust cover can be seen at the bottom right, near the rover's wheel. This image shows Curiosity's main science target, Mount Sharp. 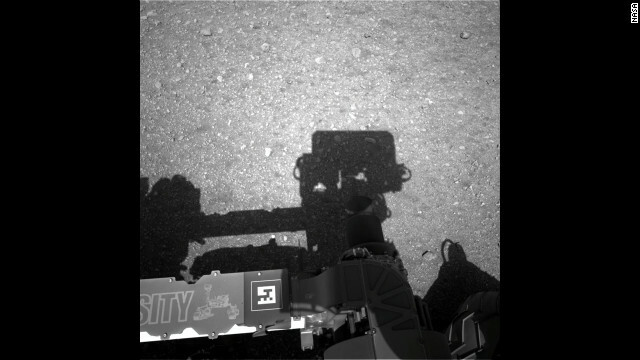 The rover's shadow can be seen in the foreground. The dark bands in the distances are dunes. Another of the first images beamed back from NASA's Curiosity rover on August 6, 2012, is the shadow cast by the rover on the surface of Mars. NASA's Mars Curiosity Rover, shown in this artist's rendering, touched down on the planet on August 6, 2012. (CNN) -- After roving across more than five miles of the Red Planet's sometimes rough terrain, NASA's Mars rover Curiosity has reached its primary destination: the base of a Martian mountain in the middle of a vast, deep crater. 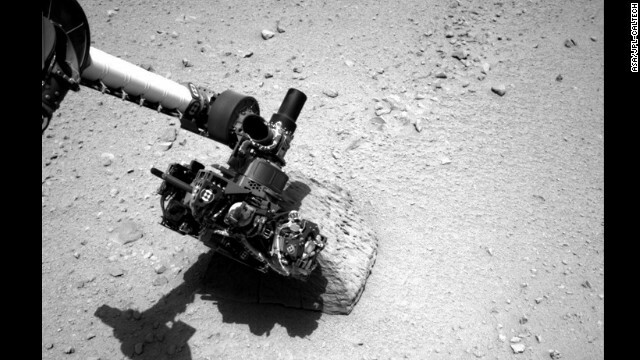 Curiosity's Twitter feed blared news of this triumphant arrival with the post, "I'm all about that base. 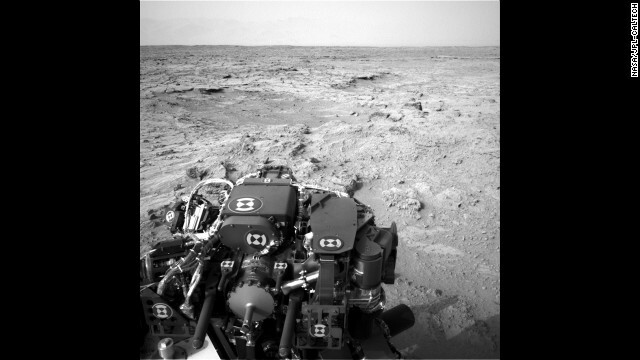 Reached the base layer of Mt Sharp. New science ahead!" in a riff on Meghan Trainor's ear worm. Scientists chose Mount Sharp as the rover's destination long before the roving lab launched from Cape Canaveral in November 2011 and touched down in August 2012. The mountain's layers are essentially records of the different chapters in the environmental evolution of Mars. Living up to its name, Curiosity explored the crater floor as it made its way to the base of Mount Sharp. It's already solved its primary mission objective, which is to determine whether the Martian environment could have been habitable to microorganisms. That answer is yes. NASA says Curiosity found evidence on Gale Crater's floor that a lake bed existed billions of years ago that offered fresh water, key ingredients for life and a source of energy for microbes. Like all great journeys, the trip to this mountain was not without unexpected twists and turns. Earlier this year, Curiosity's team members had to change the rover's route because sharp rocks were poking holes into four of the rover's six wheels.